Climate change is a real and pressing[i] issue that is becoming more relevant each day. In the Spring, 2016, Bill Gates and his wife, Melinda, released a statement outlining the nature of climate change and what we can do about it[ii]. Gates has since been a leader in establishing and developing renewable and alternative energy sources[iii]. His report was based on a concept called the Kaya Identity, which is a mathematical model of the factors involved in generating carbon emissions. This formula was developed by energy economist Yoichi Kaya in his book Environment, Energy, and Economy: Strategies for Sustainability[iv], published in 1999. This Identity has recently become more widely recognized since being used by Gates. Amount of CARBON dioxide given off by each service (C). Gates outlines in his report[v] that, together as a global community, we must work towards getting our total carbon dioxide emissions down to zero. If the total carbon dioxide emission isn’t zero, we are actively contributing to the problem and making anthropomorphic climate change even worse. To get the total carbon dioxide emissions to zero, at least one of the variables on the opposite side of the equation must equal zero as well. The population of people is increasing exponentially[vi]. We have an inherent interest in not having that number be zero. The number of services is also increasing, as technology and expanded infrastructure is brought to developing nations. As a planet, we will work to make existing technology and services more efficient, lowering the energy costs, however, no matter how efficient we can make these service, they will always require some amount of energy to function. Nothing can function off zero energy. That leaves the last variable, the amount of carbon emitted by each service, as the only option that has a foreseeable zero point. Gates sees this as the way to make our total carbon dioxide emissions zero: we need a source of energy that has zero carbon dioxide emissions and that could also be applied on a global scale, or, as Gates refers to it, a “zero-carbon energy miracle[vii]”. 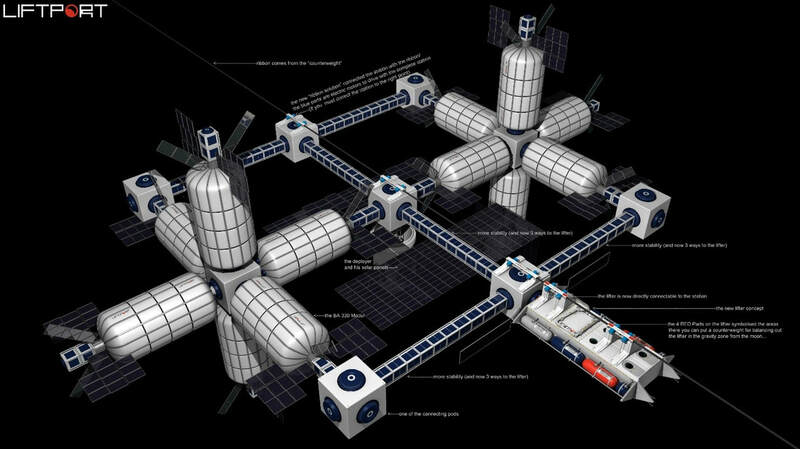 Space Based Solar PowerWe think that Space Based Solar Power (SBSP) is that ‘miracle’; we believe that the construction of our Lunar Space Elevator Infrastructure (LSEI) is the best way to establish it. The SBSP concept was first explored by Peter Glaser in 1972, when he was awarded a patent[viii] for a device he had designed that could send energy over large distances using microwaves. It dawned on him that if a satellite could harness this technology, it could collect sunlight in space and “beam energy down to Earth[ix]” via radio waves. Energy can be collected and distributed in the form of usable power – using our established electrical grid and building a new receiving antenna. If this was possible, that satellite would not be subject to day/night cycles, seasonal cycles, dust, or other debris. It could provide baseload power (almost) all the time. Despite the cost, complexity, and including transmission losses of beamed power, a solar panel in space converts 5-15x more power to the electrical grid, than that exact same panel on the ground, plugged directly into the grid. Space Based Solar Power would revolutionize our energy capturing capabilities and utilize the capacity of the largest energy source in our solar system. Using LSEIBetween 1978 and 1986, NASA and the Department of Energy jointly investigated the feasibility of developing SBSP. This investigation was extensive and cost ~$50 million[x]. Once discontinued, the study concluded that SBSP was too expensive to develop, specifically, that it was going to be too expensive to launch the materials required to build Solar Power Satellites in orbit. This is where our Lunar Space Elevator Infrastructure (LSEI) comes in – we make SBSP possible by making it economically feasible. Our first portion of the LSEI project requires $800M; that capital is invested to establish the initial infrastructure of the Elevator on the Moon. Following that stage, another $800M is invested to expand the capacity of the Earth Moon Lagrange One (EML1) space station. Lagrange Station is further developed such that it can support people and enhance manufacturing and development technology. Once the space station and PicoGravity Lab (the research center located at the Lagrange Station) are complete, we plan to spend approximately $1B to further develop the space station and the LiftPort Anchor Station on the Moon – such that our robotic Lifters will be able to mine the Moon and transport that cargo up the Ribbon to the EML1 station. Finally, with an additional $5B, we will expand our Lunar mining operations and turn a portion of the EML1 station into a solar satellite manufacturing facility. Total capital and time is ~$8B and 16-20 years. To put these costs into perspective, the most expensive dam in the world is the Three Gorges, in China, which cost ~$28B[xi], took almost twenty years to construct, displaced 1.4M people[xii], and over one hundred lives were lost. This dam only serves 1.7% of the Chinese power requirements[xiii]. Our LSEI + SBSP system will eventually power the planet. Our proposed SBSP project will be a permanent installation; intended to power the entire world – potentially ending the energy crisis for approximately $8B! First-generation solar panels could be operational in eight years after the base level LSEI is complete. A satellite could be (mostly) manufactured and fully assembled at the PicoGravity Lab and then gently pushed (rocketed) back into Earth’s geosynchronous orbit – requiring no launch from Earth and without having to fight against Earth’s gravity. A single solar power satellite will not provide enough energy to justify this project. And yes, a single solar-sat for $8B might seem expensive. However, once the infrastructure to construct the first prototype is established, new – larger – satellites will follow immediately. Many satellites will ultimately be constructed – from the reusable and expandable infrastructure crafted over time. We are targeting power-generation for the largest 200 cities in the world. To enable this, a complete mining, refining, cargo transportation, manufacturing, and assembly infrastructure will exist on the Lunar surface and at EML1. Once the first satellite is produced, economies of scale come into play such that it will lessen the cost of each subsequent satellite. The Moon will provide a surplus of resources to use in the manufacturing of satellites. With excess resources, no (Earthly) launch costs, and a robust development and production infrastructure in place, the possibility of SBSP becomes a reality. Economies of scale will be applied in a way that has never been possible before. With multiple (hundreds of) power satellites in geosynchronous orbit, we could provide clean, green, limitless, renewable energy to everyone, everywhere, all the time – with zero carbon dioxide emissions. Through the Lunar Space Elevator Infrastructure, we can establish Space Based Solar Power and together be the zero-carbon emission miracle that Bill Gates is looking for – and that humanity needs! With an SBSP system put in place, we could have a surplus of energy here on Earth. Many people believe that energy is the rate determining step of socio-economic development[i]. Every aspect of modern day life requires energy. Healthcare requires energy for hospitals, labs, heating and cooling, and research facilities. Sanitation and desalinization systems require energy to run. Even the simple refrigeration of food requires a lot of energy when food production is scaled for a developed nation. Therefore, if energy was cheap, many places in the world would be able to afford to build more developmental infrastructure and modern-day commodities into their societies. As these countries develop using the energy from SBSP, they will be ushered into the 21st century standard of living, and with that comes greater education. With more education, developing countries become more productive, and actively contribute to the progression of humanity into a better future. If energy as a surplus commodity, “resource wars” will (might!) decrease as well. Energy is a national security asset. Just as it has the power to build a country into a developed nation, restriction of energy resources could mean the demise of any nation, regardless of how powerful or distinguished. Once our SBSP system is established, we can provide energy to the world, prevent wars, provide communications and education, and bringing our world together under a common standard of surplus energy. Demonstration ProjectIn order to accomplish this dream, we have put together a small-scale, demonstration system. This is our plan to prove the feasibility and applicability of our large-scale Space Based Solar Power system. Space solar power describes a form of electrical power generation whereby solar energy is collected in space and transmitted without wires to terrestrial receivers using microwaves. The microwaves are converted to electricity which is then fed into the grid for use. Space solar power is currently not an attractive investment and thus is not under active development by the private sector. Despite this drawback, the technology offers numerous national security benefits[ii]. Therefore, space solar power deserves modest public-sector prototype funding. This funding will be used to buy down technical risk in order to close the business case. Once the business case closes for some initial markets, a virtuous cycle will initiate, leading to more investment in space solar power and subsequent improvements in U.S. national security and global prosperity. LiftPort’s demonstration project seeks to use the International Space Station (ISS) as a de facto space solar power satellite in order to prove the technology is viable. Specifically, the LiftPort Group will construct a microwave optical fiber laser transmitter array with beam steering that will be launched to the ISS, deployed on the exterior of the Station[iii] and connected into the Station’s electrical system. The microwave optical fiber laser transmitter array will convert a very small portion of the ISS’s electrical supply into microwave photons in a tightly collimated beam and transmit that beam to a pre-positioned receiver array stationed a short distance away from ISS (up to 200 meters separation). The reason for the short distance is that atmospheric optical losses are quite high, and cannot be compensated for using a relatively low optical power level. The concept can be demonstrated quite well at a lesser distance using space to space power beaming, in order to achieve satisfactory numbers. This demonstrates the feasibility for the nascent market of space-to-space power beaming at relatively easy to achieve lower power levels. The market for space to ground power beaming will require a mm wave or microwave system. The main advantage an optical system has over mm or microwave is the total absence of radio frequency interference from the optical system on terrestrial mm or microwave systems. The main advantage a mm or microwave system has over an optical system is the elimination of high loss (atmosphere, clouds, rain) as a major issue. The frequency band of the mm or microwave system must be chosen based on available systems currently on the shelf at a high Technology Readiness Level (TRL). In addition, the forward-deployed military installation’s communication systems must be taken into account to choose an available frequency band with a low probability of radio frequency interference, which must coincide with currently available on the shelf mm or microwave systems. Mm wave or microwave systems enjoy a slightly higher TRL than optical systems do. Nominal beam losses from that orbit are calculated in an available spreadsheet. The idea is to demonstrate - albeit on a small scale - that power from space can be used to perform useful tasks in space, and on the Earth. The LiftPort Group seeks $800,000[iv] for this demonstration project. $400,000 to construct the microwave transmitter array. $100,000 to launch and deploy the transmitter array on the ISS. $100,000 to construct and deploy the receiver array on the ground. Could CASIS facilitate ISS access and use? Day 1 – Funding and strategic partnerships are secured, project is initiated. Day 30 – Design reviews initiated for transmitter and receiver arrays. Design complete for transmitter and receiver arrays. Integration plan with ISS and military is complete. Day 365 – Assembly of transmitter and receiver arrays. Day 760 – Transmitter arrays are installed and checked out on ISS. [iii] Tabuchi, H., Fountain, H. (2016, December) Bill Gates Leads New Fund as Fears of U.S. Retreat from Climate Grow. [iv] Kaya, Y. (1997). Environment, energy and economy: strategies for sustainability. Delhi: Bookwell. [vi] Cohen, J. (1998). « Population, economics, environment and culture; an introduction to human carrying capacity ». Nature Sciences Sociétés, 6(2), 103. doi:10. 1016/s1240-1307(98)80061-7. [viii] Glaser, P.E. (1973). U.S. Patent No. 3,781,647. Washington, DC: U.S. Patent and Trademark Office. [xvii] This is a total guess, numbers need to be validated.